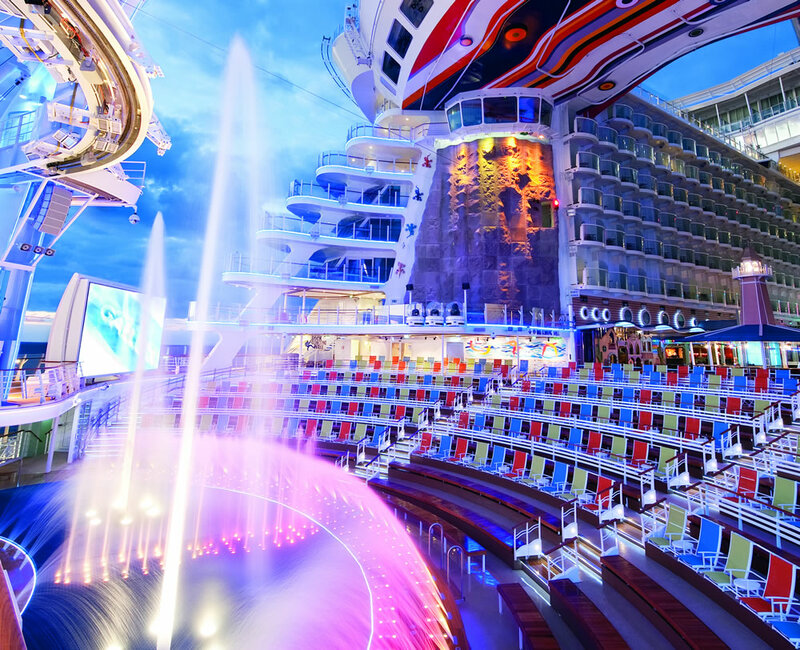 Royal Caribbean International has revealed the full line-up of entertainment planned for its forthcoming cruise ship, Harmony of the Seas, which will launch in May this year. The 5,497-passenger cruise ship will boast new shows, original productions, and more. The 1,380-seat Royal Theatre will be equipped with state-of-the-art technology and will be home to two headline shows: Broadway musical ‘Grease’ and an original production entitled ‘Columbus, The Musical’. The Columbus show has been created in the spirit of ‘Spamalot’ and tells the tale of the imagined Marvin Columbus, Christopher’s fictional, down on his luck, distant cousin. At the aft of the ship two new shows will headline at the AquaTheater. Passengers will be able to watch jaw-dropping acrobatic dives as performers jump from two 10-metre high platforms into the largest and deepest freshwater pool found at sea. The new shows are titled ‘The Fire Line’ – a 360 degree entertainment stunt show – and ‘Hideaway Heist’ – an action packed high-diving comedy show. Two new shows have been produced for the Studio B ice rink on the ship. ‘1887’ is an original production about love and adventure in Paris during the 19th century. ‘iSkate Showcase’ will give the talented skaters an opportunity to move to their favourite tunes. Red Party will offer the high-energy dance parties, with veteran DJs headlining, surprise performances and ground-breaking technology. Guests can sing karaoke classics at the On Air Club or enjoy performances from the ‘High Cs Horns’, the resident horn-led nine piece orchestra. Live comedy and music will be available in the new night-time hotspot, The Attic. Selected entertainment features from the Quantum-class ships will also appear on the Oasis-class Harmony of the Seas. ‘Puzzle Break: Escape the Rubicon’ is a puzzle adventure where participants need to solve a series of clues to escape an enclosed room. The quirky Stowaway Pianist will also pop up around the ship offering personalised micro-entertainment. Unlike on the Quantum-class ships, Harmony of the Seas will feature a spacious Royal Promenade and this will continue the tradition of Royal Caribbean’s signature theme nights and parades. Flagship events will include the ‘Totally Awesome 90s’ parade and the ‘Promenade 70s Party’. The ship will also re-introduce a party planning service called ‘Let’s Celebrate’ that can tailor events to celebrate a range of events including birthdays. Last month the cruise line revealed the design of a ten-storey slide to be installed on the cruise ship. Earlier in the year designs for a new water splash park for children were also revealed. The 227,000 gross ton vessel will briefly visit Southampton in May for two short sailings before repositioning to Barcelona, Spain, for its summer season. In October the ship will reposition to Fort Lauderdale, Florida, where it will operate on alternating seven-night Eastern and Western Caribbean itineraries.